What Pedestrians Need to Know After a Hit and Run in Florida | DeLoach, Hofstra & Cavonis, P.A. What should I do if I was hit while walking and the driver took off? Florida is one of the most beautiful places to walk and bike in the nation. While pedestrians can enjoy the health benefits of traveling without a vehicle year-round, they are also at particular risk of hit and run accidents. Thousands of people are struck and injured every year by drivers who speed away, leaving the victim to pay for his injury costs. Any accident that involves a driver failing to stop after striking someone else can be considered a hit and run collision. Cars may collide with pedestrians, and also people traveling on scooters, bicycles, skateboards, or other modes of non-vehicular transport. 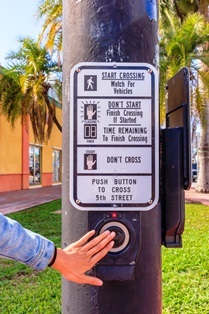 Unfortunately, Florida sidewalks are often built close to the roadway, placing pedestrians at risk of accidents when they are next to the road as well as in crosswalks. Report the crime to the police. Florida law carries high penalties for offenders in hit and run injury cases. A driver who leaves the scene of an accident, and has caused an injury, may be charged with a felony, face jail time, heavy fines. The sooner the collision is reported, the better chance a police officer will tracking down the driver—improving the odds of getting compensation for your injuries. Get medical attention. Don’t take the risk of going home after the accident: go to the hospital immediately. Even at low speeds, a pedestrian accident can result in significant physical, financial, and emotional losses. Adults may suffer broken bones or head injuries that cause them to lose months away from work, while accidents involving children or the elderly may result in permanent disability or death. Speak with an accident lawyer. The best way for victims and their families to get compensation after these kinds of accidents is to speak with a personal injury attorney. In order to prove your case, you will need to gather evidence, give statements, and total your medical costs and financial losses accurately. We can examine the circumstances of the crash, tell you what to expect in your case, and work to protect your rights as you take the time you need to heal. The Crimes Compensation Trust Fund. This fund is paid to victims of crimes, or their survivors, who are struggling financially after an injury. In order to be eligible, victims must have reported the crime to police within 72 hours of the event. Individuals must also apply to the Florida Bureau of Victim Compensation within one year of the accident. Personal Injury Protection (PIP) coverage. Victims of pedestrian accidents may claim compensation from their auto insurance, even if they weren't driving at the time of the crash. While all Florida drivers are required to carry PIP insurance, the coverage usually only provides up to $10,000, which may not be enough to cover the costs of a pedestrian’s injuries. Uninsured motorist insurance. Drivers who have selected uninsured/underinsured motorist coverage as part of their auto policies can get additional compensation if they are struck while walking. As the options for compensation in these cases will vary depending on the individual circumstances, it's a good idea to meet with an attorney after a hit and run pedestrian accident. Your lawyer can go through your various insurance policies to determine the best way to get maximum coverage for your injury costs. Our law firm works on a contingency-fee basis, so we do not collect any fees until your case is won. Simply fill out the quick contact form on this page to set up your consultation with an attorney.